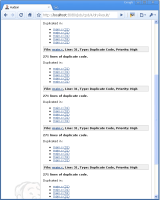 The path to the source files that contain duplicated source code is not shown. If there are several source files with the same name, but in different locations, there is no way of knowing in which files the duplication occurs. The problem becomes apparent when the source files are in the C language and there is no package names associated with the files. If there are no package associated with a source file, the path should be presented instead. Email discussion with Ullrich Hafner on this problem attached in file dry.html. etomhel added a comment - 2010-06-02 01:23 - edited Email discussion with Ullrich Hafner on this problem attached in file dry.html. [FIXED JENKINS-6683] Show links of dry warnings with package name or relative path. SCM/JIRA link daemon added a comment - 2010-06-04 04:53 Code changed in hudson User: : drulli Path: trunk/hudson/plugins/analysis-core/src/main/java/hudson/plugins/analysis/util/model/AbstractAnnotation.java trunk/hudson/plugins/analysis-core/src/main/java/hudson/plugins/analysis/util/model/FileAnnotation.java trunk/hudson/plugins/dry/clean.sh trunk/hudson/plugins/dry/pom.xml trunk/hudson/plugins/dry/src/main/java/hudson/plugins/dry/DryPublisher.java trunk/hudson/plugins/dry/src/main/java/hudson/plugins/dry/parser/DuplicateCode.java trunk/hudson/plugins/dry/src/main/java/hudson/plugins/dry/parser/DuplicationParserRegistry.java http://jenkins-ci.org/commit/31723 Log: [FIXED JENKINS-6683] Show links of dry warnings with package name or relative path. Ulli Hafner added a comment - 2010-06-04 17:27 Integrated in Hudson Plug-ins (Compile) #10 [FIXED JENKINS-6683] Show links of dry warnings with package name or relative path. [FIXED JENKINS-6683] Show links of dry warnings with package name or relative path. Do you have a local (or test) instance where you could install the new plug-ins (analysis-core and dry) from Hudson Plug-ins (Compile) #10? Since I only have Java projects in my test setup it might be good to have a test run with a non Java project before the official release will be out. etomhel added a comment - 2010-06-07 03:38 The duplication links of old builds (recorded with the old plugin) show the full path Confirmed to work. The duplication links of new builds (recorded with the new plugin) show the relative path (starting from the workspace root) Confirmed to work.